I n a world where making meaningful personal connections with others feels difficult, and face to face conversations are being replaced electronically, there is one surprising remedy to that feeling of disconnect: wine. And it’s not what you might think. The euphoric feeling you get when you drink fermented grape juice releases your inhibitions and makes you and the world that much friendlier. While it may do that to a degree, that’s not why people are bonding. It’s the collective experience when learning about wines that brings people together where their lives may not otherwise have intersected. Wine? Yes, New Hampshire-made wine, specifically; and even more specific than that, wine made in the Mt. Washington Valley and surrounding areas. Home to three wineries: Whippletree Winery located in Tamworth, NH; White Mountain Winery, in North Conway, NH; and Seven Birches Winery settled in Lincoln, NH, the perimeter of the Mt. Washington Valley has suddenly become the Napa of New Hampshire. And while these wineries are making award-winning wines, the winemakers are also keeping people connected. They’re drawing a crowd, bringing people together, and linking lasting friendships. One of the main ingredients you’ll find in this sense of unity comes from shared experiences. Of course, you’ll find your traditional wines at each winery. They all make your beloved cabernets, pinot noirs, chardonnays, and sauvignon blancs. They make their own lines of fruit wines as well. What goes into every blend and bottle at each winery is as diverse as the people who travel to taste them. Perhaps that’s the magic in the recipe of what brings people together: the opportunity to be surprised and delighted by the flavors, the process, and the people encountered along the way. 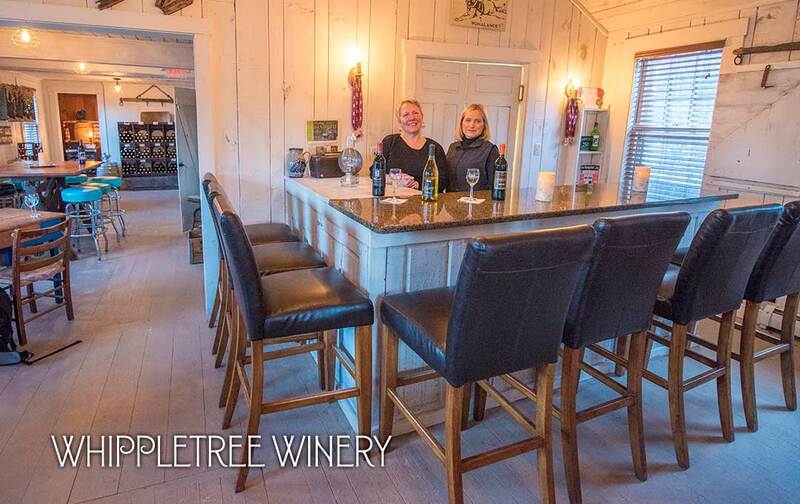 Known as the “the winery in the woods,” Whippletree Winery was created by Yvonne Staples and Lauren Barrett. Both were connected through wine when Lauren was a customer of Yvonne’s previously owned wine shop. Lauren being an apprehensive wine drinker, and one who had never really found her place in the wine world or her favorite kind of wine, was taken with how Yvonne’s wine stood out against all her past wine drinking experiences. The taste wasn’t overwhelming or bitter. It was smooth and enjoyable. It was inclusive and made her feel welcomed at the table. Lauren and Yvonne kept in touch through the years, but when Yvonne retired, Lauren couldn’t accept that. She felt that Yvonne’s talent for making wine was just too good to go into retirement. So together, they forged Whippletree Winery. Yvonne, an artist by nature, lets her creativity flow through her wines. 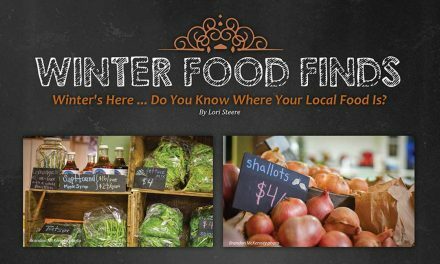 Lauren, an entrepreneur and small-business owner in her hometown, brings the marketing, branding, and administrative side of things to Whippletree. Over time, they’ve seen some cross-over and Lauren can be found waking up in the middle of the night thinking of a new wine to make, or the perfect ingredient that will set their wine apart. Together, they have created a line-up of 25 wines that have won over 30 medals. They source high-quality juice from grapes all over the world. They receive supplies from Cape Town, Africa; Mendoza, Argentina; Finger Lakes, New York, and beyond. Their wines are inspired by each other and the lives that they lead. That can be seen in some of their flagship wines, including their signature chardonnay, “Bossy.” This white wine is a blend of Australian and American grapes. Its personality is big and joins you just like a guest would at the table. The Australian grapes provide the aromatics and depth, while the American grapes create structure to the wine. Of course, there are a few other ingredients to Bossy, but those are trade secrets—ones you can ponder while sipping a glass! Another favorite is their “Fierce” cabernet. It’s a blend of three different wines that starts out smooth and has a delicious, peppery bite at the end. As Yvonne leads me through my own personal tasting experience, starting with a glass of Fierce, it feels almost like a guided meditation. Yvonne encourages me to experience the wine from all my senses. She teaches me how to inhale the scent of the wine and fill my sensory receptors. She instructs me on how true sommeliers take their first sip. It’s akin to swishing the wine like mouthwash around your mouth to get it acquainted with the flavors. Finally, I learned how to enjoy the second “true” sip, where I really take note of the experience as a whole. Whippletree Winery is nestled off the beaten path in Tamworth, NH. There, all the blending, bottling, tasting and entertaining is done in a cozy and inviting rescued lake-house previously owned by the inventor of the snowmobile, Virgil D. White. The house offers a history lesson on top of a wine tasting experience. You’ll find old maps of Tamworth, and farming equipment that has found a second life as furniture and rustic decor. Lauren and Yvonne’s synergistic partnership and deep friendship is felt throughout the barn; it brings a warm and light feeling to the tasting room. Their goal is to provide guests with an authentic Tamworth experience; which, if you’ve never been to Tamworth, is worth your time to take a drive. The quiet town of Tamworth is currently undergoing a renaissance. This antique town has all the New England charm you would expect from an old farming hamlet, but is a hub of forward-thinking businesses. Tamworth’s economic development is burgeoning with a local distillery, meadery, brewery, and town store that all feature some version of entertainment and education. A trip to Whippletree is not just a wine-tasting excursion, it’s a part of something bigger: a second chance for a small town and a new beginning for two women who love what they do. Take a trip 30 minutes north and you’ll find yourself in the heart of North Conway Village, at the doorstep of White Mountain Winery. You’ll be welcomed by three pit bull rescue pups, Doc, Stella, and Lucy, who make it clear that they run the show. Their owners, husband and wife team, Bryon and Ali, Ali’s father, Dan, and their dedicated friend and employee, Trish, are the full-time winemakers, wine-bottlers and labelers, customer service reps, and maintenance crew. They are a true micro-winery and the definition of small-business owners. Going on their fifth year of ownership, they have quickly landed in the top eight producers of hand-crafted wine in the state of New Hampshire. They now feature 50 varieties of wine, ice wine, and port, with 25 to 30 varieties on the shelves at all time. Strangely enough, Ali and Bryon didn’t start out as wine drinkers. Wine wasn’t their first choice and it didn’t always provide a flavor profile they could get behind. That was until they tried a particular brand of fruit wine. Both of them took a part-time job at the winery prior to owning it, and both tasted fruit wine during their tenure as employees. It was unlike anything they had ever experienced in the wine world—and they couldn’t get enough. Fruit wine bears its own distinction—it often provides a more “welcoming” experience for people who have otherwise not enjoyed wine or have been intimidated by it (cue those complicated flavor profile descriptions of a wine’s essence). Ali and Bryon call it the “gateway wine,” because for wine drinkers like them (which basically meant non-wine drinkers at the time), it allowed them to enjoy a glass of wine with their friends and appreciate the same aspects of their fruit wine that their friends who were drinking a cabernet or pinot grigio were also enjoying. It evened the playing field for them, and it has done so for many other guests don’t love wine (yet), but who have come to the winery seeking the fully immersed wine-tasting experience. 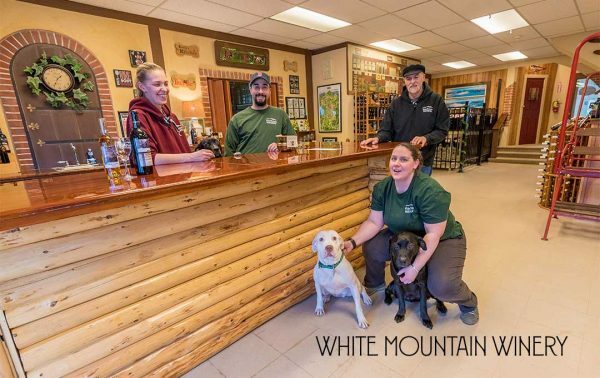 White Mountain Winery’s team defines the New England work ethic that all small-business rely on. Ali, Bryon, Dan, and Trish, share the responsibility across all facets of the business. After working at the winery for a period of time, the opportunity to take over fell into Ali and Bryon’s laps when the previous owner prepared to retire. Looking to try something new and realizing the opportunity in front of them, Ali and Bryon jumped in feet first and have been growing steadily ever since. They not only became wine drinkers, they became winemakers and shop owners. They do everything by hand. All their wine is made in small batches and is hand-bottled and corked. White Mountain Winery’s team defines the New England work ethic that all small businesses rely on. Ali, Bryon, Dan, and Trish, share the responsibility across all facets of the business. Of course, none of it could be possible without the rallying of Doc, Stella, and Lucy. To show they’re appreciated, Bryon and Ali raise money for the local animal shelters and bully breed rescuers through a tip and donation jar in their tasting room. To date they have raised $15,000 in donations. It’s a cause dear to their hearts, one they will continue to support, and hope to expand. What started out as a job, has become a lifestyle that continues to grow. Bryon and Ali have had to expand their space three times to make room for all their wine tanks and barrels. 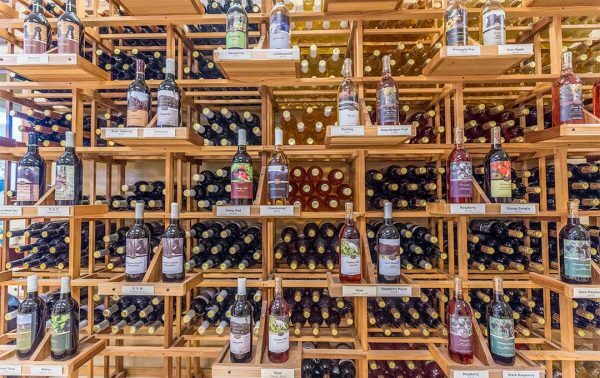 It’s not surprising when you read their menu and see they offer 16 varieties of fruit-flavored wine, 20 varieties of red wine, 10 varieties of white wine, three varieties of port, and four different ice wines. 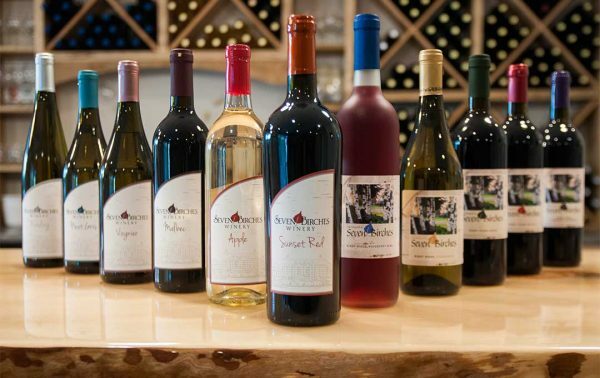 Customers can also purchase private label wines, where White Mountain Winery bottles wine using customer-designed labels. These make creative and unique party favors and holiday gifts—which many customers take advantage of for gifting at Christmas. A new development that Ali and Bryon are excited about is the process by which they age their dry red wines. Most wines are typically aged in barrels after the fermentation process. Ali and Bryon have layered onto that process by aging their dry reds in bourbon barrels supplied by Wrigley Ridge Distillery in Maine. The bourbon barrels provide the wine with a nice bourbon nose, draws a fruit note, and has a port-like finish. It’s a wine that can’t be overlooked and is definitely set apart from other reds you might find on a grocery store shelf. It’s worth a taste (and perhaps stocking up on a few bottles) the next time you find yourself at the winery. White Mountain Winery success has been felt (and tasted) all the way down the East Coast. In one instance, their wine left such an impression on a guest visiting from Florida, she raved about it to the person sitting next to her on the plane during her flight home. That same seat mate made it a point to seek White Mountain Winery out on her next visit to New Hampshire—and fell in love with the wines herself. White Mountain Winery’s reach also extended to Rhode Island, where Ali was in a store aisle and ran into a patron of the winery who had been up for a tasting that past weekend. Another innovator in the wine world, leaving a lasting impression on all its guests, is Seven Birches Winery. 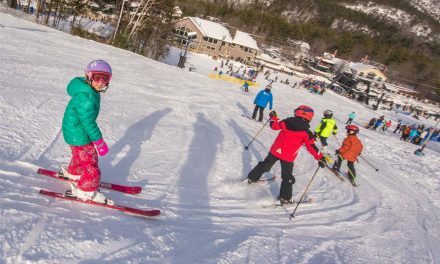 Located in Lincoln, NH, Seven Birches is nestled in the RiverWalk Resort at Loon Mountain. It’s a sophisticated operation that maintains the strong New England background from which it came. It was started by Mark LaClair, a long-time Lincoln businessman, who was making wine out of his basement as a hobby. He was giving his wine away as gifts, and lucky recipients encouraged him to become a professional winemaker and sell his products commercially. For someone with a background in marketing, hospitality, and consulting, wine-making didn’t seem to quite fit in. Mark had an opportunity to make wine for Windy Ridge Orchard in North Haverhill, NH and run its tasting room, which finally gave Mark the push to expand his wine-making into the business world. That was in 2010. He has gone from making his self-branded, formerly called “Not Bad Wine” in his basement to winemaking on a destination farm to opening a resort-quality winery in 2016. In 2018, Mark can produce 36,000 bottles of wine in his production room. Walking into Seven Birches Winery, you can sense every detail that went into making this winery a reality. The natural lighting is beautiful and has a view to match, and while Mark is able to mass-produce, the winery still very much maintains a boutique feel, reminding you of the amount of care that goes into each of those bottles. 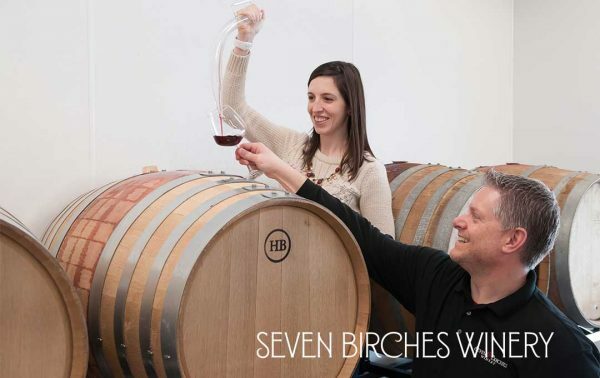 A rare distinction of Seven Birches Winery is that Mark and his team not only make their own wine from the juice of grapes, they also process those grapes in-house. They import pallets of 36-pound boxes (known as “lugs”) filled with grapes from all over the world, including California, Washington, Oregon and even places such as Chile and South Africa. This species of grapes is known as Vitis vinifera, and are the original European grapes that make the traditional chardonnay, pinot grigio, cabernets, and so on, that many of us have come to love. A rare distinction of Seven Birches Winery is that Mark and his team not only make their own wine from the juice of grapes, they also process those grapes in-house. Mark also imports hybrid varietals from the Finger Lakes Region of New York. Grapes from the northern hemisphere are harvested in the fall, while grapes from the southern hemisphere arrive in the spring. For transitional seasons, Mark and his team also make fruit wines using the fruit from his original winemaking roots, Windy Ridge Orchard, as well as other local farms. He and his team, which consists of one other winemaker and five customer service representatives, crush and de-stem all of their grapes in-house. They are one of a handful of wineries in New Hampshire that has the capability and skill to take on this part of the winemaking process, which adds a layer of interest to their wines. While achieving the highest quality for each bottle of wine is of utmost importance to Mark, his target for that relies on “letting the wine become who it wants to be.” A self-taught chemist, he of course, ensures the balance of all of his wines, measuring tartness versus sweetness, alcohol volume, acidity, and more in all of his wines. But his cornerstone method for wine-making is to maintain simplicity. He doesn’t want to over-complicate his wine and wants to allow a grape to stay as close to its character as possible. Mark uses this approach to make over 25 varieties of wines. His flagship wines include syrah, cabernet sauvignon, sangiovese, tempranillo, pinot noir, sauvignon blanc, chardonnay riesling, moscato and many more. He also makes blueberry, apple, and strawberry fruit wines, as well as other seasonal varieties. A tour of Seven Birches Winery exposes how much Mark has invested in this winery. 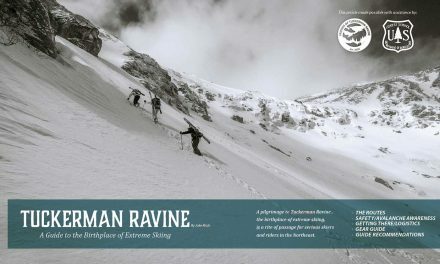 It goes far beyond a business, and one can sense how much passion and grit went into making such an operation thrive. Guests can book a winery production room tour and tasting, join the Seven Birches wine club, or take part in its barrel club. With this particular club, guests enjoy the ultimate custom winemaking experience, where they give input on the variety of grapes or fruit they want their wine made from, and how they want it to be aged. Guests become a winemaker’s assistant and create their own unique blend of wine, as a winemaker’s assistant, adding another layer to their own wine story. 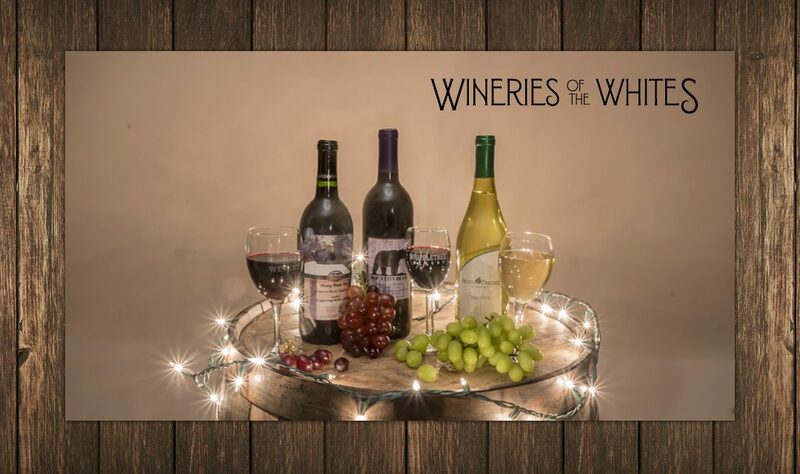 Whippletree Winery, White Mountain Winery, and Seven Birches Winery are leaders in the boutique winery world. Their love of wine and the winemaking process can be palpably felt when visiting their operations and speaking with them. But beyond the grapes and fruit and grasping the flavor profile of a freshly poured glass, it’s the bringing of people together that keeps their work and purpose grounded. What can be shared over a glass of wine or passed on through the gift of a custom-made bottle goes beyond just a drink—it’s a pleasant link to a shared experience that will linger in the mind much the way your taste buds can help resurrect a place, time, and mood in a split second when they encounter an old favorite. It’s a touchstone for connection in an unlikely place. Entering the wine world can be intimidating, even for experienced wine owners. Varietals, vintages, regions, labels, blends, aromas, viscosity, pairings, prices are all important factors to be considered. There are two kinds of wine, the kind you like and the kind you don’t like. Your palate is unique and can best develop by trying a variety of wines. Utilize tasting rooms to “test drive” wines. Start with dry wines first and move toward sweeter wines when tasting. Move out of your comfort zone when tasting wines, be adventurous. High-quality wines can be sweet, off dry or extra dry … be open minded. Food pairings can be either of a similar or of a contrasting flavor. Vacuum seal your bottle to best preserve your unfinished wine. Hold your glass by the stem or by the base. Look at your wine to admire its color and clarity. Swirl your glass to aerate the wine to open up its aromas. Smell or “nose” your wine by putting your nose close to the wine and deeply inhale. The nose and mouth are connected organs of sensation; your palate is now awake. Take a small sip and “mouthwash” the wine all around your palate. Your second sip is what your wine should taste like for your unique taste.